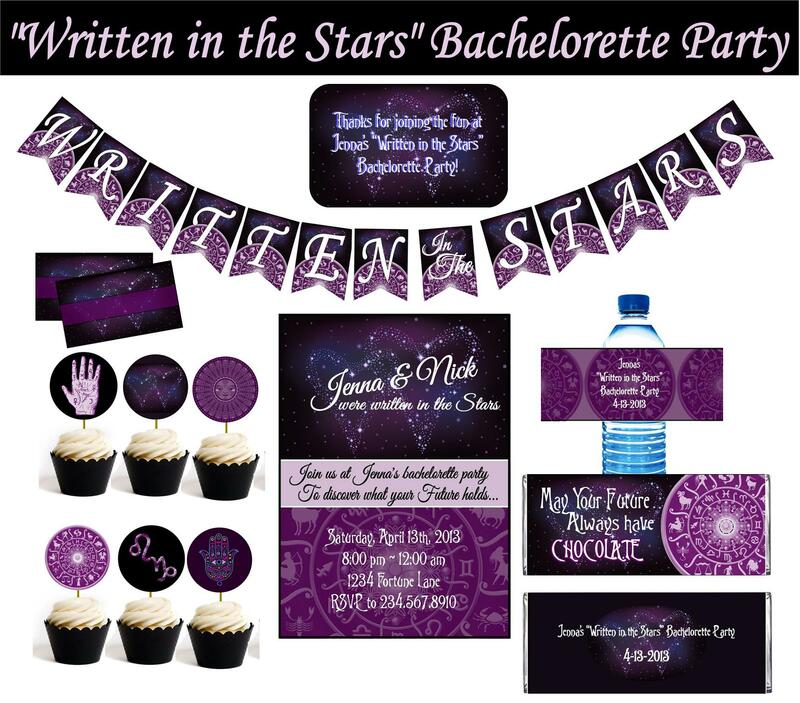 This is the perfect bachelorette party theme for love that is written in the stars. 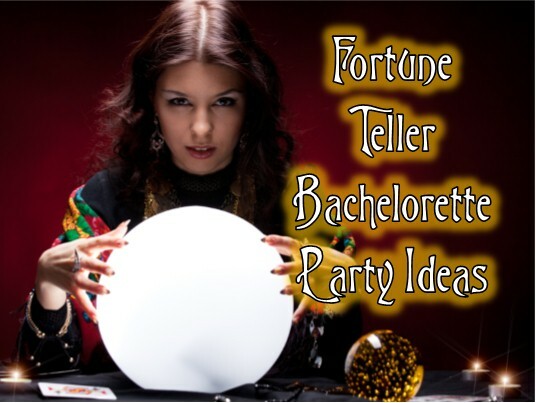 Decorate your party area with mystical charm and hire a fortune teller to come read all the girls palms, or astrology charts, or maybe peek into her crystal ball. Below you'll find a list of other magically fun games and activities to play at your party. We also have personalized printables, invitations, banner, and more to help you set the mood for fun. You will need index cards, pens and a marker. On each index card you will use the marker to write the beginning of a prediction. For example; in three years you will…, a man in a purple suit… you win the lottery but…, or you will meet… are all sentence starters that leave room for a funny ending. Once you are done with writing the cards, put them in a pile (Fool’s Fortune pile) face down and place the pens next to them. As your guests arrive you will have them take a card and a pen and finish the statement on the card with a minimum of two sentences. Put the completed cards aside until everyone has arrived. Gather everyone around and have each guest draw a card from the Fool’s Fortune pile. Each person has to read their fortune aloud to the others. All you need for this game is a bottle of your favorite drink, shot glasses and bangle bracelets. There are two things to remember during this game. The first thing to remember is to refrain from saying the bride or grooms name. The second thing to remember is to slyly encourage and listen to others to see if they are saying the names. If someone says either name they must take a shot and give up a bangle to whoever caught them. At the end of the night the person with the most bangles is the Gypsy Darling and they take home a prize. This game requires index cards and pens. As your guests arrive have them write down their most embarrassing moment on one of the blank index cards and give it to the host. After everyone has completed their cards shuffle them up and assign someone to be the Fortune Teller. The Fortune Teller will pull a card and read it silently. They will then decide who they believe it happened to and read the card to the person like they are psychic. If they are correct with their prediction they get to keep the card. If they are wrong they are out of the game. The players with a card at the end of the game take home a small prize. This is more of an activity but a great keepsake for the bride to be. You will need sewing needles, fabric pens, scissors, and thread. You will also need to request everyone bring a piece of clothing with them that the no longer need. When everyone has arrived have them gather around a table. Everyone will cut their piece of clothing into a square and use the fabric pens to write a short message to the bride. A 5x7 square or larger is recommended. Stitch each piece together to create one large piece. When the stitching is complete the bride will have a gypsy throw that she can keep through the years to remind her of the great people who have been with her during her journey in life. This game can get silly and hilarious very quickly. All you need is a group of willing participants and some drinks. Everyone should gather around so that you can all hear one another. Give every player an two index cards, one reading guilty the other reading innocent. One person takes the role as the guilty mind reader and names a scenario ( skinny dipping, lying about your age, sneaking out of the house as a teenager, smoking pot, etc..) Everyone puts a card face down in front of them representing whether they are innocent or guilty of this scenario. The guilty mind reader goes around to each person and guesses if they are innocent or guilty of this crime. If the mind reader guesses correctly - that person must drink, if they guess wrong then they must drink. After they have guessed for everyone, then another person becomes the guilty mind reader and comes up with a new scenario. Keep playing until everyone has a chance to be the mind reader. This game is best played using sips instead of shots. This game requires drinks and a deck of cards. The game will start with the deck of cards face down. The top card is flipped up and the first player must predict if the next card is going to be higher or lower than the card showing. If they are wrong they have to take a shot. If they are right they don't take any shots. If the card value is the same then they have to take a double shot. The next player then has to predict high or low for the new card. Play until you make it through the deck. All you need for this game is a pen, a piece of paper and a sense of humor. Before the guests arrive write “On your wedding night…” on the piece of paper. As the guests arrive they will write two to three sentences on the paper. It is like a chain story everyone must keep going. But, they can only read the entry before theirs. Once everyone has written part of the wedding night prediction, the bride must read it aloud for everyone to hear. This will set the night up for great laughs and cutting loose. The bride and groom will break a lamp in the midst of "fun" on their honeymoon. Their first child will have their mothers blonde hair. The bride's uncle will corner someone at the wedding and go on and on about how the democrats are ruining the country. The grooms brother will come onto all the bridesmaids. After each prediction see which way the pendulum swings. If it swings clockwise, the prediction will come true. If it swings counter clockwise the prediction will not come true. If it doesn't move - the answer is yet to be determined. This printable set comes ready to print and includes invitations, banner, cupcake toppers, bottle wrappers, favor labels, thank you tags, and tent cards. Click on picture for details and ordering instructions.